For the next few years, deficits are looking pretty good. But the interest owed on the country's cumulative debt is set to nearly quadruple over the next decade. The Congressional Budget Office projects that interest will be $233 billion this year, or 1.3% as a share of the economy. By 2024, it will reach $880 billion, or 3.3% of GDP. That means interest will account for the lion's share of the $1.1 trillion deficit projected for that year and will come close to what will be spent on Medicare. Interest costs will jump for two reasons. The first is the improving economy, which is expected to push what have been historically low interest rates to higher, more typical levels. The second reason is that the underlying debt will remain very large and continue to grow. 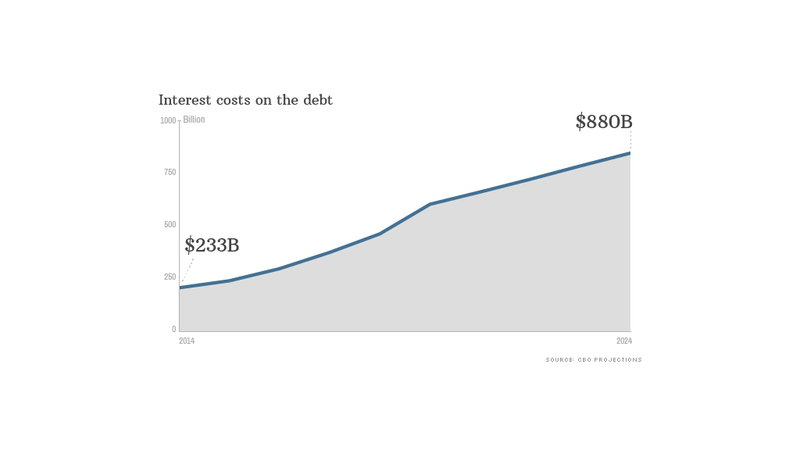 The CBO projects that under current policies, public debt will reach $21 trillion -- or 79% of GDP -- by 2024. That would be its highest level in more than 75 years and would leave debt at nearly double its long-term average of 40% of GDP. The thing about large and growing interest payments is that they consume tax revenue that could otherwise be spent on the country's priorities. In contrast to the rapid growth of interest spending, outlays for defense programs and domestic programs -- such as education, infrastructure, disaster relief and law enforcement -- are on track to fall to their lowest levels since 1962. Barring policy changes that better align spending with incoming revenue, the debt -- and the interest owed on it -- will continue to grow faster than the economy in subsequent decades. That's a trajectory the CBO describes as "unsustainable."